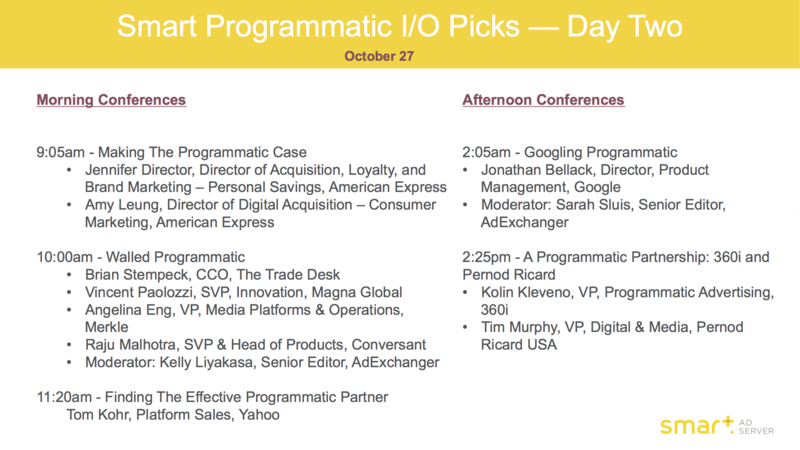 As someone on the demand side of the equation, which Programmatic I/O conferences will be worth your while? Take a look at my list below. As Smart AdServer’s Demand Partners Manager, I guarantee they’re the right ones for you! And if you’re in a rush, check out the Quick Guide below. Everyone knows that ad fraud and viewability are hot-button issues in ad tech today, and buyers need to stay informed about how to ensure inventory quality. Amanda Rizzo, Ad Ops Manager at Linkedin will discuss tips for how to do this for both prospecting and retargeting campaigns. Native ads can be a great way for both publishers and buyers to monetize, but they need to be implemented correctly. Casie Attardi, Director of MoPub Professional Services at Twitter will discuss technical and operational best practices for this ad format. Video is the future. But how does one go about buying the format programmatically? 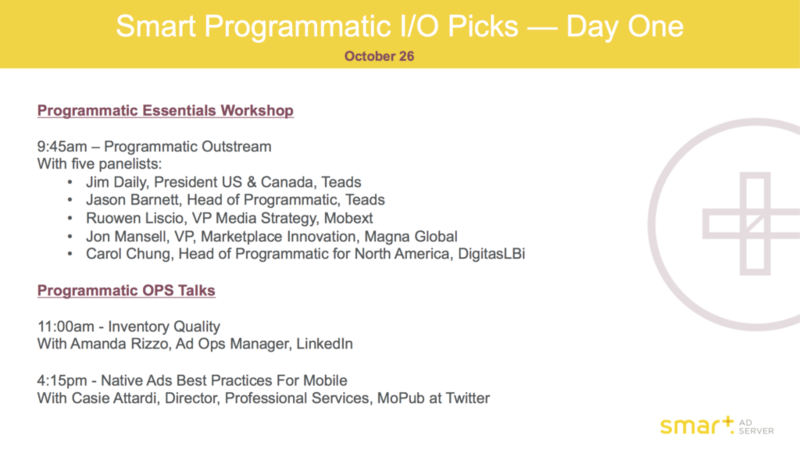 In this session, Teads’ Jim Daily will talk insights, programmatic outstream and what’s on the horizon. Top agency execs will join the conversation to discuss the rise of outstream with Jason Barnett. Ever want to get into the head of a leading marketer so that you can better understand your clients? Then this talk with American Express digital marketing execs Jennifer Director and Amy Leung is a must! What’s their perspective on programmatic media and what have these two learned over the years? Find out in this session. This is as complete a buy-side panel as you can get! What, in their opinion, are the latest changes in programmatic? What role does header bidding, which gives publishers more control, have on prices? And what about walled gardens and PMPs? Find out how the fast-changing programmatic supply chain will influence your customers. As a DSP, having the best ad tech stack for your clients is essential. Find out what Tom Kohr of Yahoo believes is the best way to reevaluate the technologies your partners — or potential partners are offering you. It’s important to make sure you’re working with solid solutions that are both high-quality and efficient, especially in today’s fractured and over-complex digital advertising ecosystem. It’s important to know what’s happening on the publisher side if you’re connected to an SSP. This session with Jonathan Bellack, the head of DoubleClick Ad Exchange and DoubleClick for Publishers, will give an overview of how both buyers and sellers are navigating programmatic to grow their businesses. He’ll also touch on user experience, a topic of utmost important for marketers, DSPs and SSPs alike. It’s always good to get a glimpse into high-level brand strategy. Learn what works for premium marketers in this session with 360i and Pernod Ricard. Their digital-first strategy focuses on programmatic media buying. In this session, Pernod Ricard and 360i will run through the strategy behind programmatic campaigns for brands like Avion, Malibu, Jameson and Absolut.